The pulse is quickening in the heart of Pusat Bandar Puchong as the township is set to welcome a new addition to its skyline. Residents here are already looking forward to a unique lifestyle offering that is set to be the next landmark in the bustling township. Located on a 21-acre freehold tract fronting the LDP Expressway and called Setia Walk, the integrated development comprising a hybrid of commercial and residential components is expected to inject new dynamism and fresh excitement into the retail scene in the Klang Valley. Developed by S P Setia Bhd, it comes as no surprise that SetiaWalk boasts several distinctive features that are trademarks of the group's developments which places a strong emphasis on innovation, landscape environment and creating value for its purchasers. Ranked No 1 for four consecutive years from 2005 in The Edge Malaysia Top Property Developers Awards and voted Best Developer by Euromoney for three consecutive years since 2005, this is S P Setia's first foray into the commercial sector and the developer is set to impress with the RM900 million SetiaWalk. Comprising 4 to 7-storey blocks, the first phase Retail Offices provide retail outlets on the ground and first floor which are interconnected via covered walkways, beacon staircases, lifts and escalators while the offices above are served by shared lifts. The developer is also offering 46 units of SOHO. These are positioned as trendy units for living and home-based businesses that would appeal to the likes of creative agencies or professional services such as boutique-size advertising agencies, law practices, management consultants, accountants etc. For recreational activities, residents and visitors can look forward to a 6-storey entertainment centre comprising fashion houses, family restaurants, a fitness centre, family karaoke and a 7-screen Cineplex. SetiaWalk also feature a 24-storey corporate office tower and a 120-rooms business travelers' hotel that will cater to the needs of the business communities from the surrounding areas. Meanwhile, the residential component housed in three blocks comprising 253 units each, will offer a very modern living lifestyle for the young and trendy with units having a view of a lake or a forest view. According to S P Setia's Divisional General Manager for Commercial Development, Richard Ong, the myriad of attractions and wealth of experiences provided by SetiaWalk makes it ideal for businesses as well as families. Positioned as an upper middle class destination that boasts innovative architecture that is not only pleasing to the eye but carefully thought out, another added attraction to SetiaWalk has to be its creative landscape. Over the years, S P Setia has built a name for itself in creatin outstanding and award winning landscapes in its township developments. Some of these award-winning ideas have been carefully incorporated into SetiaWalk. A continous body of water has been created as the focal point and forms the central spine of SetiaWalk, greeting pedestrians with water jets, fountains, water columns, cascading waterfalls, sand dunes, wading pools and modern sculptures to soothe the visitor. The Retail Offices' launch in October last year was a huge success. To date, sales have reached 93% with a good mix of investors and owner occupiers. According to Ong, investors are confident and are expecting good investment returns because of the overwhelming response from retailers and the public. Purchasers of SetiaWalk's Retail Offices C.S.Yap and T.M. Lee both agree that SetiaWalk is a unique concept and that the developer has come up with an innovative design to encompass more than just rows of multi-storey shop office units. 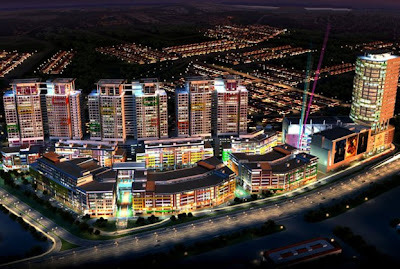 "S P Setia has put much thought into creating an interesting hybrid between conventional shop offices and a retail mall. I feel it is a winning combination of a work and play environment in a well integrated commercial and residential hub that will serve as a major attraction for investors, businesses, shoppers and residents. " Yap adds.